Cut the baguette into 1/2-inch slices. Lay the pieces on a cookie sheet. Put some olive oil (and/or butter) in a small cup and brush the slices using a pastry brush. Broil or bake at 350°F for about 10 minutes, or until the slices are a light golden-brown. Remove from the oven and set aside. 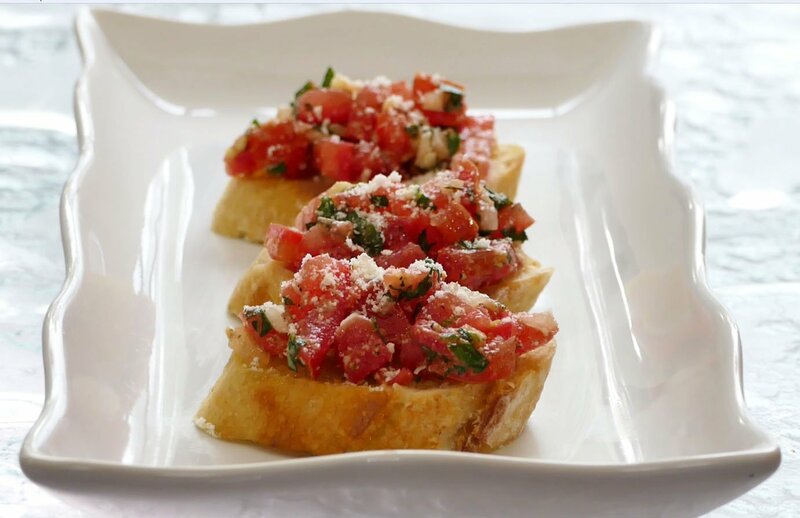 In a medium bowl, combine the tomatoes, onion, garlic, cheese, basil, salt, and pepper. Add olive oil. Gently mix all the ingredients. Place a heaping teaspoon or more of the tomato mixture on top of each bread slice. Sprinkle with a hint of grated cheese. Garnish with thin shreds of fresh basil. Serve immediately.